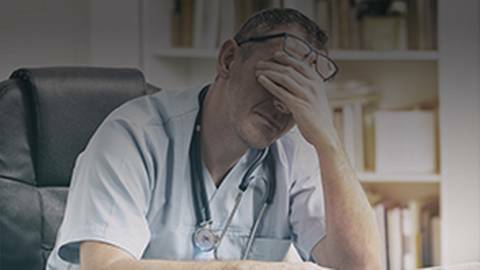 Over 50% of physicians in the United States are suffering from at least one symptom of burnout, often pushing themselves too hard to try to keep up with the physical and emotional demands of the profession. In the process of trying to help others, some physicians end up hurting themselves. This is a special edition of Book Club on ReachMD. I am your host, Dr. Jennifer Caudle, and joining me today is Dr. Shawn Jones, an ENT physician and author of Finding Heart in Art: A Surgeon’s Renaissance Approach to Healing Modern Medical Burnout. Dr. Jones will be sharing his own story of facing burnout in his medical career and the surprising coping method he discovered to rise above it. Dr. Jones, welcome to the program. Thank you. It’s good to be here. This is a topic that is something that we’re hearing more and more about, which I’m personally happy as a family physician myself, and it’s a topic that I think really affects every practicing doctor to some degree. Can you discuss a little bit about what we’re seeing in today’s society in terms of physicians and other healthcare providers when it comes to career fatigue or burnout? Well, they have really only been measuring burnout since 2011 in a very specific way, so while we know that it’s been rising pretty quickly in terms of order of magnitude and the rate is very steep, we really don’t know what was going on before 2011. We just know that despite the fact that we’re aware of it, it seems to be worsening. I think that’s one of the things that really has people concerned, is that even though we’re aware of it, we seem not to be making a lot of headway towards mitigating it in some respects. In your book, Finding Heart in Art: A Surgeon’s Renaissance Approach to Healing Modern Medical Burnout, you mention that you struggle with similar issues in your career. Can you touch upon your own experiences and discuss how you came to write this book? Well, I had been practicing for about 15 years, and I knew that there was something wrong. I felt a sense of loss of personal satisfaction in my work, that I thought if I changed this or did this a little differently, that things might get better, and what I ended up doing was doing all the wrong things, actually. I started working harder, putting more patients on, really increasing the rate at which I was starting to suffer, and it was really when my wife, Evelyn, confronted me with my lack of emotionality that it became necessary, I realized, to get some professional help, and so that’s what I did. I basically took six weeks off and sort of reevaluated things, and that experience of taking that time off and then coming back and really finding joy again in the practice of medicine is what spurred me to write the book. That’s very insightful, and again, I think this is going to be so helpful for all of the healthcare providers that are listening to your story and hearing about the book that you wrote, which is about your experiences. Can you talk a little bit about those six weeks that you took off and what it was like and how you felt and how you spent that time? Well, it’s interesting that you ask me how I felt or referred to that because that was one of the things that really struck me is that I wasn’t feeling anything. I had essentially almost completely detached and became depersonalized, and so part of that six weeks off was about time and intensive outpatient psychotherapy, regaining my humanness to a degree, and a lot of that was involved with becoming in touch with my heart again. And that’s really when I started to get an affinity for art and recognizing that that was a way that was sort of what’s called a third thing that I could look at and get in touch with my feelings in a way that wasn’t quite as vulnerable or fear-inducing or scary as it might have been if I was talking about my feelings otherwise, because being a surgeon, we generally don’t have feelings anyway, so the saying goes, so talking about feelings for a surgeon is kind of a scary thing. Understood, and I think to your point, I think a lot of physicians or people who are not physical physicians feel intimidated when they are discussing issues of feelings and our emotions, and I think that is another reason why I’m so happy to interview you for this is because I think a lot of times we as physicians and healthcare providers don’t exactly talk about how we’re feeling. We may not talk about it to each other. We may hide how we’re feeling. That’s one thing I wanted to ask you, if you could discuss with your listeners, was it difficult from a procedural standpoint to take the time off? Did you feel supported in your quest to find fulfillment again? Did you feel like you were understood in what you wanted to do, or was that a difficult thing to try to accomplish? Well, I did have some concern about taking time off and coming back to surgery in a sense. That actually ended up being no difficulty whatsoever. It was in a sense like riding a bike. There wasn’t much that was left. You know, it was a little bit longer than a two-week vacation, but at the same time, the skills that were there were still there. In terms of the acceptance by the medical staff of taking time off, the only people generally that take time off are people who have an issue with the Board of Medical Licensure and are required to take time off and get an addiction under control or something like that, so in that sense I had quite a bit of explaining to do, because it’s really unusual for somebody to just say, “You know, I’m going to have a timeout here and take care of myself,” and I had some explaining to do, and that gave me some issues a couple times, which I talk about in the book, but in the end it was all fine. It worked out for the best, and I’m really tremendously grateful that I had people in my life that were willing to speak truth into it and help me from another perspective see myself and become more self-aware, and I think in that sense life has been really, really great after having done that. You know, in your book you talk about—you mentioned this a little bit before—how you spent some of the time that you had off, and art is something that you talked about in your book, Renaissance art, so could you talk a little bit more about that, how art played and still plays a role in your life? For me it was about connecting with beauty, and obviously, they call those aspects of study in college the humanities for a reason, because they tend to make us more human, and so for me I connected with Renaissance art for a couple of reasons. I think, number one, I was raised as a Christian, and so that art spoke to me and with respect to the spiritual side of my life and the mindfulness practice that I was developing with respect to centering prayer and other things of that nature, but also, when it came to being a physician, several of the paintings had to do with either death or dying or healing—and the Good Samaritan, for example—and so all of them really spoke not only to that spiritual side of my life but also to that aspect of my life that involved being a physician, and in that sense really, I think the depth of emotions and feelings that they were able to spurn for me was greater because of that dual relationship there. I think that’s really interesting how art played a role in that time, but you kind of came to art in studying humanities, and for different reasons it helped you, religious reasons and humanitarian reasons and other things like that. I think that’s very refreshing because I think it really shows that there are so many different ways that we can reconnect with ourselves and with others, and so I want to segue a little bit to maybe advice that you have for other people. You’ve gone through this, and you also took, in many ways, heroic steps to change how you were feeling. And so for those healthcare professionals that are listening, many of them who might relate to how you feel in terms of burnout, or how you felt, what are some coping mechanisms or other resources that you might recommend? Well, there are some simple things to do, and I call them simple because they’re relatively easy to discuss, not because they’re necessarily easy to implement as a practicing physician, but the simple things are to take care of yourself, get plenty of sleep, make sure that you take time off when you feel as you need to, get proper nutritional intake and make sure you do something outside of medicine. A lot of people enjoy music, hiking and beautiful surroundings, something that connects you with beauty in a way that touches you, and for every person that’s a little bit different. I think one of the really more difficult things to figure out is recognizing that burnout speaks a lot more about the organizational milieu in which you practice than it does about you as an individual, and if all we do is increase our own personal resilience, then at some point we can all be in a situation where we’ll burn out. It doesn’t matter how resilient we are. So we have to begin to look at the structures that we are in as individuals and physicians and healthcare organizations and try to change the way we practice, because Maslach, who described burnout years ago, said that it was “a dislocation between what people are and what they have to do,” and it is “an erosion in values, dignity, spirit and will,” which is essentially an erosion of human soul. And so in order for us to really combat burnout, we have to know who we are and what we can tolerate, and the difference between what we do and who we are is what causes burnout, and so we have to get health care back to caring for people and that being the primary purpose of physicians and not being data entry clerks, for example. There was just an article in JAMA in March—I think the 29th—from Nevada, an opinion piece about how we need to get physicians back to being able to care for people, which is what they went to medical school to do, and that’s one of the reasons we’re seeing so much burnout, I think. I mean, I certainly agree with you there on a personal note as a family physician, and I think all of us sort of feel sometimes overwhelmed by the system with which we work in, and I think your comments about how the environment that we work in may facilitate or be involved with rates of burnout I think is interesting too. But I really like what you said about the idea of doing something outside of medicine. I think sometimes we get to a point where all we do is medicine. We eat, breathe, sleep it, and all the ways that we used to be and things we used to do fall by the wayside, so I really like that encouragement of people kind of doing things, physicians and healthcare providers doing things outside of medicine, and also the basics, right?—not forgetting to eat properly and sleep enough at night. I mean, it’s not necessarily intuitive. I think it’s easy to fall into bad habits, so I think those are really, really good suggestions. I guess, as we’re coming to a close, I’d like to ask you: Are there any additional messages that you’d like to leave with our audience, or are there any other sort of angles on this topic that maybe we haven’t had a chance to discuss? The individual things are obviously the things over which we have the most control, so connecting with colleagues so that you have another eye on your own behavior and evaluating your working relationships, so I think it’s really important having a friend at work, obviously. Self-compassion, be forgiving to yourself. It is very difficult to practice compassion towards others and your patients if you’re not compassionate towards yourself, so it’s not a selfish thing to take care of yourself. And in fact, the idea or secret of caring for the patient is then caring for yourself while you’re caring for the patient I think is important—and then just making sure that you take care of that spiritual side of your nature, whether it’s through mindfulness-based stress reduction, or whatever particular religious background you have, making that an important part of it. And then the organizational things are much more difficult and are going to come more slowly, and I think that’s where we need patience and persistence to look at how medicine has structured how we’re paid, not because the dollars are so much important but because we need to get rid of the things that we do that are just to satisfy a billing code and don’t really augment care. Those things really frustrate physicians—prior authorizations, all of those types of things. Yes, especially sort of broadening out the issue is how is our health system and how are we moving forward with health care and how is that impacting us? Well, this has been very compelling, and it’s a story that so many physicians today can relate to and learn from. I want to thank my guest, Dr. Shawn Jones, for sharing his personal journey detailed in his book called Finding Heart in Art: A Surgeon’s Renaissance Approach to Healing Modern Medical Burnout. Dr. Jones, it was wonderful having you on the program. Thank you for joining us. Thank you. It was great being with you. I’m Dr. Jennifer Caudle, and to access this episode and others in the series, visit us at ReachMD.com where you can Be Part of the Knowledge. Thank you for listening. Dr. Shawn Jones describes his own experience with career burnout and how he found solace in an unlikely place: Renaissance art. Career burnout is unfortunately all too common in the healthcare industry, with over half of physicians suffering from at least one symptom of burnout. Not only that, but the rates of depression and suicide in this industry are significantly higher than others. To discuss this very real threat to health care providers, Dr. Jennifer Caudle is joined by Dr. Shawn Jones, ENT physician and author of Finding Heart in the Art: A Surgeon's Renaissance Approach to Healing Modern Medical Burnout, who recants his own personal journey in overcoming career burnout.